Dr. Jessica Duggan has long called Yuma home, and is very excited to be able to practice podiatry in her hometown community. After growing up in Yuma, and graduating from Kofa High School, Dr. Duggan attended Northern Arizona University in Flagstaff, AZ. There she earned her Bachelor of Arts in Art History and Bachelor of Science in pre-med Zoology. As an undergraduate, Dr. Duggan spent a year of study at the University of Rhode Island and met her husband there! Dr. Duggan studied podiatry at Midwestern University, in Glendale, AZ and earned her Doctor of Podiatric Medicine degree in 2010. Her podiatric studies took her all over the country, from Seattle to Boston, Philadelphia and New York. She was selected to take part in a three-year surgical residency program at United Health Services Hospital in Binghamton, New York. Her training enabled her to take part in a mini-fellowship in Alpharetta, Georgia, where she studied diseases involving the skin and nails. Additionally, Dr. Duggan spent time in Baltimore, Maryland, at the Rubin Institute of Advanced Orthopedics, at Sinai Hospital, where she studied limb deformity correction. 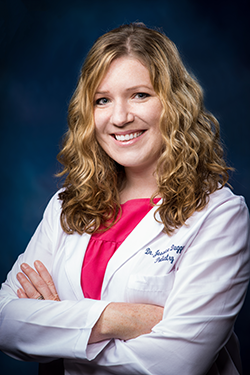 During her residency, Dr. Duggan was an associate clinical faculty member at Upstate Medical School, participated in multiple research projects, and attended conferences and lectures throughout the east coast. After completion of her surgical training, Dr. Duggan earned the distinction of being Board Certified from the American Board of Podiatric Medicine. Despite years of living in the frigid northeast, Dr. Duggan is happy to be home in the Yuma area! © 2019 Yuma Foot Care. All Rights Reserved. Site Design by Infinity Medical Marketing.